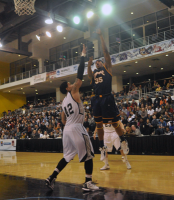 Quinnipiac’s Dave Johnson goes for a layup in the first half of Sunday’s game vs. LIU-Brooklyn. Quinnipiac’s Ousmane Drame goes for a layup in the first half of Sunday’s game vs. LIU-Brooklyn. 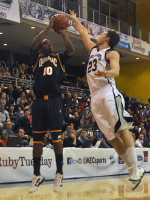 Quinnipiac’s Garvey Young takes a shot in the first half of Sunday’s game vs. LIU-Brooklyn. Quinnipiac’s Evan Conti reacts after a basket in the first half of Sunday’s game vs. LIU-Brooklyn. Quinnipiac’s Jamee Jackson controls the ball near the post in the first half of Sunday’s game vs. LIU-Brooklyn. 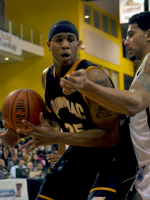 Quinnipiac’s James Johnson drives to the hoop in the second half of Saturday’s game vs. LIU-Brooklyn. 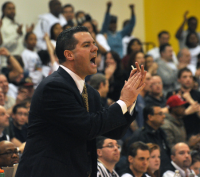 Quinnipiac’s Dave Johnson calls a play in the second half of Sunday’s game vs. LIU-Brooklyn. Quinnipiac’s Dave Johnson tries to draw a foul in the second half of Sunday’s game vs. LIU-Brooklyn. Quinnipiac head coach Tom Moore signals to a referee during a timeout in the second half of Sunday’s game. Quinnipiac’s Jamee Jackson reacts after he blocks a shot in the second half of Sunday’s game vs. LIU-Brooklyn. 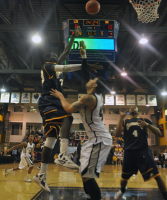 Quinnipiac’s Ousmane Drame goes for a layup in the second half of Sunday’s game vs. LIU-Brooklyn. Quinnipiac cheerleaders take the court during a timeout in the second half of Sunday’s game. Quinnipiac’s Jamee Jackson goes for a layup in the second half of Sunday’s game vs. LIU-Brooklyn. Quinnipiac fans cheer in the second half of Sunday’s game. Quinnipiac’s Ike Azotam drives to the hoop in the second half of Sunday’s game vs. LIU-Brooklyn. Quinnipiac head coach Tom Moore reacts to a foul call in the second half of Sunday’s game. 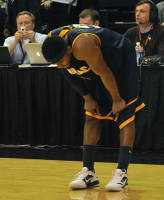 Quinnipiac’s James Johnson crouches after the final buzzer in Sunday’s game vs. LIU-Brooklyn. Quinnipiac players hug senior guard James Johnson after the buzzer in Sunday’s game vs. LIU-Brooklyn. Quinnipiac’s James Johnson walks off the court after the final buzzer in Sunday’s game vs. LIU-Brooklyn. 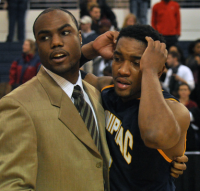 Quinnipiac’s Evann Baker hugs senior guard James Johnson after the final buzzer in Sunday’s game vs. LIU-Brooklyn. 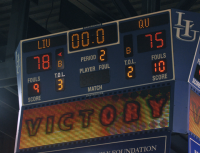 The final scoreboard reads LIU-Brooklyn 78, Quinnipiac 75 at the Wellness Center. 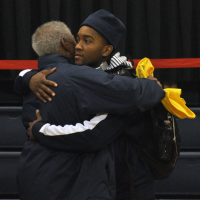 Quinnipiac’s James Johnson hugs his father after Sunday’s game vs. LIU-Brooklyn.